Knut Stegmann: Das Bauunternehmen Dyckerhoff & Widmann. Zu den Anfaengen des Betonbaus in Deutschland 1865–1918. Tuebingen/Berlin: Ernst Wasmuth 2014. Abstract: Concrete based on Portland cement is one of the most important innovations in the field of building construction in the 19th century. The „triumph“ of the material is inextricably linked with the upcoming concrete industry. 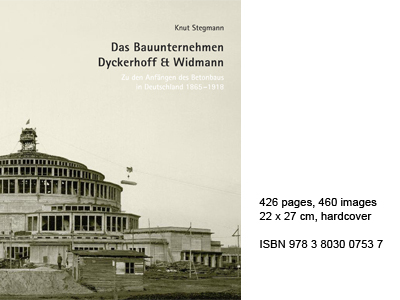 The book deals with the Dyckerhoff & Widmann Company (Dywidag) as one of the most important protagonists in that field in Germany. The company’s systematic experiments laid down the foundations for the expansion of concrete constructions. Organizational developments, partly based on study trips to the US, improved the productivity on the construction sites by mechanizing and optimizing the building processes. Marketing strategies, largely unknown in the building industry, contributed to the distribution of the technical innovation. In this way the company gradually succeeded in opening up new markets for concrete: from precast concrete components to products of civil engineering and eventually to (famous) architecture like the Centennial Hall in Wroclaw. The book includes an illustrated catalogue with 486 built structures and projects as well as an overview of the complete company’s history until its insolvency. The book won the prize for Business History 2011 awarded by the German Gesellschaft für Unternehmensgeschichte e.V. Printed with the generous support of the Dres. Edith und Klaus Dyckerhoff-Stiftung, the Gerold und Niklaus Schnitter-Fonds für Technikgeschichte at ETH Zurich und the Ed. Züblin AG, Stuttgart and in ccoperation with the Deutsches Museum, Munich. Knut Stegmann, Globalizing Building Technique – The Centennial Hall in Wrocław, in: Nina Moellers and Bryan Dewalt (eds. ), Objects in Motion: Globalizing Technology, Washington, DC: Smithsonian Institution Scholarly Press 2016 (Artefacts: Studies in the History of Science and Technology, 10), pp. 2–21. in German: Knut Stegmann, Die Dywidag-Versuchsschale in Wiesbaden-Biebrich von 1931. Ein Beitrag zur Frühgeschichte des Stahlbeton-Schalenbaus in Deutschland, in: Beton- und Stahlbetonbau 111 (2016), issue 8, pp. 532–538. → free full text (PDF).